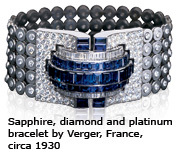 The organizers of the 1925 Paris Exposition des Arts Décoratifs declared with great exuberance that only works of jewellery demonstrating “new direction and true originality” would be worthy of their event. AH of the anonymous entries were screened by a committee of mysterious judges, and only upon the spectacular unveiling were the designers’ names revealed on little brass plaques hung beneath their creations – Cartier, Chaumet, Lacloche Freres, Mauboussin, Van Cleef & Arpels and others – names that endure as much as the style they created. Ultimately, the 1925 exposition was the defining point of the movement we now call Art Deco. flourished then declined between the two World Wars, but despite their brief vogue, Art-Deco jewels still feel contemporary to our eyes – in fact, they have an enduring contemporary feel. It’s no wonder the style has spawned so many reproductions – imitation is the highest form of flattery – but this proliferation can make authentication difficult. Fortunately, there are ways to distinguish a true period piece from a reproduction. Art Deco was born out of new technology. After 1920, synthetic sapphires became easy to produce and were so praised for their durability compared to enamel that many came to feature prominently as decorative elements. Some jewellery houses disdained this practice and used only natural sapphires. The brilliant-cut diamonds that accented so many jewels owed their proportions to the young American mathematician Marcel Tolkowsky, who published his work in 1919. Tolkowsky’s ideal cut was a sensation. Never before had diamonds been so brilliant, which made for the striking high contrast black- and-white designs, or pieces that feature diamonds next to coral and other unusual substances. Demand for diamond jewellery tripled almost overnight. The early ideal cut diamonds can be easily identified by their broad pavilion facets – a holdover from older cuts and thus a recognizable Art-Deco detail. Virtually all fine jewels of the period used platinum to hold the stones in place, thanks to the genius of Louis Cartier, who set the trend. A single decade’s worth of technological innovation equipped the jewellers of the world to create an entirely modern look, and the interplay of these variables can give a clear picture of a piece’s age. examination of the metalwork and gemstones. The gallery and the back, Diamond, emerald and platinum bracelet by Tiffany, circa 1925 with five Asscher-cut diamonds. always handmade, often feature intricate geometric or foliate scrollwork. The surface exhibits more severe and minimalist outlines while accommodating the gemstones in precise settings. All elements of the item will show the same level of attention to detail and delicate workmanship. Some characteristics can almost certainly rule out an item’s Art-Deco status. Diamonds, and indeed most gemstones, were always mounted in platinum. White gold is occasionally seen, but only in pieces made after 1930. Casting techniques were only developed after 1940, so any mold lines were non-existent. In general, unfinished details, inconsistencies, clumsily cut and set stones or ill-matching stones are all indications of reproduction. 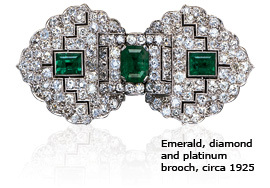 Baguette, square and emerald cut diamonds all debuted between 1922 and 1925; other cuts are uncommon. Stones that were set later will often have more prominent or less sophisticated claw settings, as a result of casting or molding. The most common cause of confusion surrounding the identification of Art Deco results from our (very contemporary) disbelief at the quality of workmanship that produced it. For a brief period of time, all the spirit and enthusiasm of the early twentieth century found expression in the workmanship of the nineteenth. It was a convergence that could not last. The mechanization and the fascination with efficiency that inspired these designs would soon put an end to them.